We present the progress on the benchmarking project for high school timetabling that was introduced at PATAT 2008. In particular, we announce the High School Timetabling Archive XHSTT-2011 with 21 instances from 8 countries and an evaluator capable of checking the syntax of instances and evaluating the solutions. Ahmadi, S., & Rorije, B. (2010). High school timetabling problem repository. http://opt-kd.cse.dmu.ac.uk/www/. Bonutti, A., De Cesco, F., Di Gaspero, L., & Schaerf, A. (2010). Benchmarking curriculum-based course timetabling: formulations, data formats, instances, validation, visualization, and results. Annals of Operations Research (to appear). doi: 10.1007/s10479-010-0707-0. Kingston, J. H. (2009). The HSEval high school timetable evaluator. http://www.it.usyd.edu.au/~jeff/hseval.cgi. Post, G. (2008). Benchmarking project for (high) school timetabling. http://www.utwente.nl/ctit/hstt. 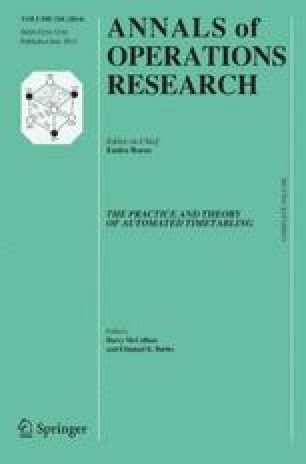 Post, G., Ahmadi, S., Daskalaki, S., Kingston, J. H., Kyngas, J., Nurmi, C., & Ranson, D. (2011). An XML format for benchmarks in high school timetabling. Annals of Operations Research (to appear). doi: 10.1007/s10479-010-0699-9.